He has specialised in company law, insolvency law and administrative law. He has generally been briefed in cases involving constitutional, banking, insurance, labour, income tax, mining and intellectual property law. Prior to being called to the Bar in 1977, he served his articles of clerkship at a leading Johannesburg firm of attorneys. 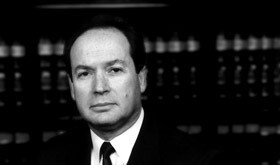 He was awarded senior counsel status in 1997 when he received his Letters patent. He has appeared as counsel or consulted on brief in several countries outside the Republic of South Africa including Swaziland, Botswana, Namibia, Lesotho, Hong Kong, United Kingdom and the USA. He has since 1997 regularly acted as a judge in the High Court in Johannesburg and Pretoria. He has received appointments to act as an arbitrator in domestic arbitrations and has received appointments to act as a commissioner in respect of enquiries into the affairs of domestic private and public companies. He has appeared regularly in all the divisions of the High Court in South Africa, including the Supreme Court of Appeal and Constitutional Court. He has appeared in more than 95 reported cases the most significant of which are referred to in part “A” below. As an acting judge, he has also delivered numerous judgments of which the most significant may also be referred to in part “B” below. The profile of his practice covers a large spectrum of commercial matters specialising in company law, insolvency law, administrative law, constitutional law, corporate mergers and acquisitions; schemes of arrangement and regulatory work. He has regularly appeared as the lead counsel for the Registrar of Medical Schemes and for the Council for Medical Schemes (the Regulatory Authorities for the registration and control of Medical Schemes in South Africa). In the early 1990’s he was involved in the Masterbond bankruptcy and more particularly in the litigation and the scheme of arrangement relating to the sale of the Fancourt Resort situated outside George in the Cape. This bankruptcy was considered at the time to be the most publicised and largest group liquidation ever in South Africa. In 2005 he represented the Securities Regulation Panel and the Chairman of its Executive Committee as the Lead Counsel in the attempt by Harmony Gold Mine to acquire the entire issued share capital of Goldfields Limited. He has been the lead counsel in a number of leading cases both under the old Companies Act, Act No 61 of 1973 and under the new Companies Act, Act 71 of 2008, more particularly relating to Business Rescue, Insider Trading, Market Abuse and in the interpretation of the provisions of both the old and new Companies Act. He has been involved as lead counsel in opposing various and separate class actions brought on behalf of thousands of investors against directors and other individuals in relation to the affairs of numerous companies involved in property-syndication groups involving tens of billions of rands. He has recently appeared on behalf of several minority shareholders against the erstwhile directors and auditors of African Bank which had then been placed under curatorship by the South African Reserve Bank. This litigation is currently proceeding. He has also represented minority shareholders in other actions against delinquent directors for damages caused to such shareholders. He is currently the lead counsel in the class action against the Steinhoff group of companies, their auditors, directors and investment bankers for shareholders’ losses in the region of R185 Billion Rand.